I was ecstatic to receive these photos from her son's nursery. 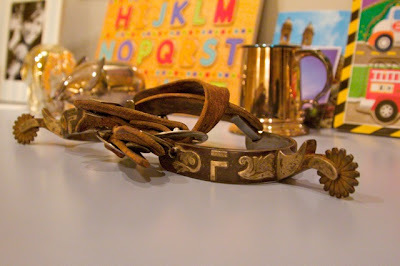 I had heard about it from a few friends in my home town of Fort Worth and am delighted to share the photos with you. 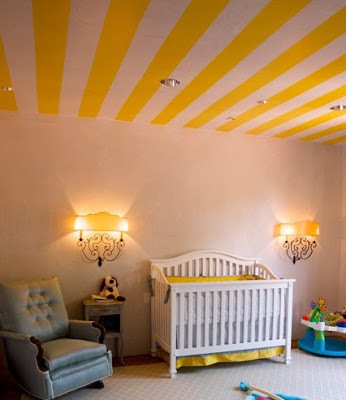 The designer and mother behind the design, Sheridan is very creative and even took it upon herself to paint the stripes in the room when a painter said that it could not be done. Nothing like some do-it-yourself painting when you are 36 weeks pregnant! I hope that these photos inspire you to not forget about the ceiling. It just goes to show you how some paint and creativity can truly change the feeling of the room. And also take note on the curtains, the color combination is beautiful and will have staying power for years. 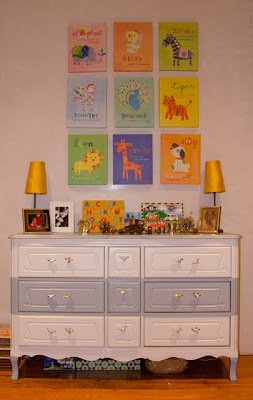 West's nursery successfully evokes a playful, imaginative, and chic look which works for a boy or girl's room. Well done! What was the inspiration for your room? We did not find out if we were having a boy or girl so it definitely had to be gender neutral. I wanted something that would work with every child we will eventually have if I always use the same room as the nursery, but I also considered the possibility that I would forever make this room my son's room. Based on that my mother (an interior designer) and I made design decisions as far as fixtures, draperies, rugs, and paint that would last until he went to college, or came back and visited with children of his own. What was the first piece that you purchased for the room? 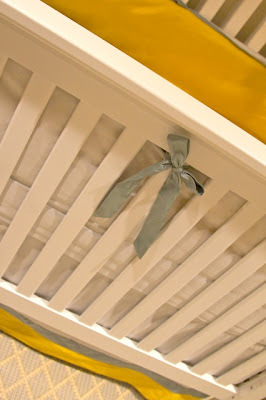 I selected the fabric swatches and designed the crib bedding and draperies. I always loved the idea of a deep golden yellow and an icy blue combination. What is your favorite aspect of the room? 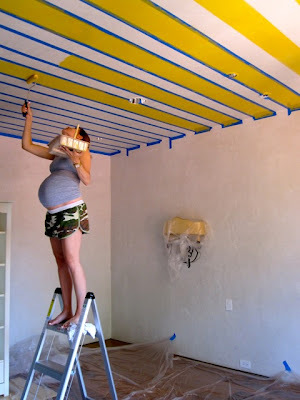 The stripes that I painted on the ceiling when I was 36 weeks pregnant! I hired a painter and after and hour he told me that it could not be done. I took matters into my own hands and did it from start to finish in two days. I also love the chest of drawers I painted. It belonged to my father-in-law's mother and is over 100 years old. Originally a faded avocado green, I continued with the stripe element of the room and wrapped them around the chest horizontally in the two shades of blue on the draperies and bedding. I replaced the old worn out pulls with new Michael Aram bird pulls that I ordered of of Lowes. Now that your room is complete, what would you change or do differently if you could? I would like a new rocking chair/glider. I reupholstered one of my husband's grandmother's rocking chairs and it is too narrow, creaky, and just too old to be functional like I need. 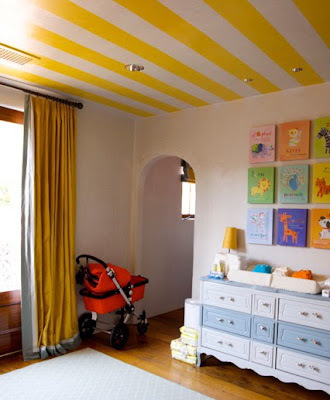 Can you please share the names of lines or websites that you used to design your nursery? The rug is Stark, and since these photos were taken I purchased the Madison changing table system from Pottery Barn Kids that I really love. The canvas animal prints are from Two's Company.